Ive recently aquired an erider scooter i believe that needs new batteries. Does anyone have any recommendations on a replacement?. Ill be running a QS273 hub motor with a 72v 80amp controller. Was thinking lipo as the cheapest route but are there any viable lithium options (without costing a bomb). Does your scooter have the blue chl 50ah cells, or the yellow 60ah thunder sky cells? Leaf modules would probably be the cheapest, but would involve a bms change. I would recommend something programmable such as the zeva offering. From memory the erider scooters were fairly light on for instrumentation. Scaled voltage guage instead of an ah counter for a fuel guage, for instance. Have you had a chance to do a capacity test? The erider batteries are under sized imo. jordanmills wrote: I bought it without any batteries so unsure as to what were the originals. Ah no batteries makes it interesting. Calb 60ah cells should fit, as may the Calb 70ah cells. The original bms is not of the greatest quality, assuming it still has one. The motorcontrollers tend to have a high failure rate, it would be worthwhile to test it, just to make sure it's worthwhile. I do know of another erider for sale here in Perth. This one has a sevcon controller installed. It may be cheaper. Buying that scooter and keeping yours for parts than buying new parts for yours. Cheers, i've got one local here for $700. Controller has been swapped out for an ebike version (72v 80amp), so a much simpler setup paired with the QS273. I'll have a look at these cells. Well ended up buying 9 6s 12000ah Graphene lipos. Were on special and too hard to pass up. Will run in a 18s3p configuration for 75v 36ah pack. Will bulk charge majority of the time and balance if needed. Will make a build thread. 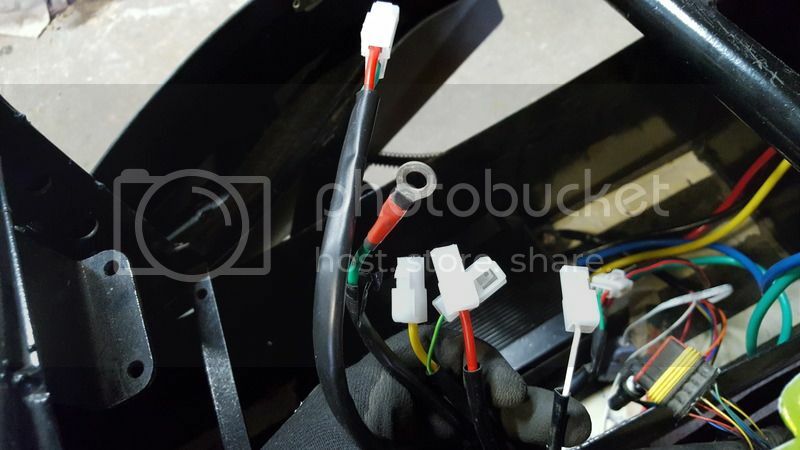 Can anyone help identify what these wires/ plugs are for??. Would help to know what controller you are using. I recently bought an Erider without batteries or controller as well. I have been researching batteries as well. I am very keen to get the CALB LiFePO4 72ah batteries which appear to be the highest capacity I can squeeze into the battery box. I am trying to get them directly from china from evlithium.com cost about $145 each delivered. They are about $200 each from ev-power.com.au with postage to east coast. A cheaper way to do it would be getting Winston 40ah batteries from EVwork.com.au or www.thebackshed.com/basiclynatural for $72 each. I need 24 cells. Where did you find your lipos? I managed to power up the 12V system yesterday. Under the lockable compartment in front of the seat in a conector with black, green and yellow wire. POsitive 12V to black, negative to green will power up the normal electrics. The bike has only done 1900km!. My bike still has the connector for a Sevcon controller so I have downloaded the manual for that controller and was planning to then figure out the wiring for my Sabvoton controller. I bought the Sabvoton on Alibaba for $350 delivered. You can get Size 4 Sevcon on Ebay for US$400 but Sevcon wouldn't give me an access file for their software and the IXXAT conector you need for them is $300. I am very keen to get the CALB LiFePO4 72ah batteries which appear to be the highest capacity I can squeeze into the battery box. I am trying to get them directly from china from evlithium.com cost about $145 each delivered. They are about $200 each from ev-power.com.au with postage to east coast. out of curiosity, have you considered leaf modules? Does your e-rider have the TC Charger installed? Where can you buy Nissan modules in Australia? AQuick search hasn't had any results. I have a TC charger. Evlithium quoted US$390 door to door but it does seem to cheap as even Get would be $300. I don't want them dumped at the dock. I second Matt's comments - just buy them from EV-Power or EV-Works, depending on what you're after. Going direct to China is simply not worth the hassle. At least if you buy them from an Australian business, everyone is covered by the Australian Consumer Protection legislation. pahealey wrote: Where can you buy Nissan modules in Australia? Graeme from Suzi Auto and ozdiyelectricvehicles has imported these in the past. The trouble is that they come from wrecks, so supply is not guaranteed. It also depends on when he's imported a batch, and how many are left over. Last edited by coulomb on Sun, 31 Jul 2016, 08:48, edited 1 time in total. Yes i did the maths on the battery setup. Using leafs was going to be around $2500, with BMS included. Using the CALB cells was slightly more i think. I picked up the Lipo's from Hobbyking for $80 a pop, Bought 9 for $800. 75v 36ah should get me moving nicely. Had the auto Elec guys sort out my wiring for $150, Will pick it up tomorrow. Had a dud DC DC converter so a replacement was ordered. Should be good to go. Has anyone tried to buy Nissan leaf Batteries new from Nissan? I believe they are about $8500 for 24kwh (when sold as replacement) which is very reasonable. There should have been an isolation switch / circuit breaker under the seat. There is a very large thread on the V is for Voltage forum on the e-rider and the guy strips it down and repalces a controller, etc with lots of pics. May be helpful to you. Are you using a BMS for your LiPo? Last edited by jateureka on Mon, 01 Aug 2016, 01:46, edited 1 time in total. jateureka wrote: There should have been an isolation switch / circuit breaker under the seat. Been through that thread, and even emailed another guy for pics. Maybe i should post them up here as a resource. I have been looking into Lipo option suggested by Jordan. 6S lipo cells are 22.2V or 25.2V at full charge. 3 in series gives 66.6V nominal voltage or 75.6V at full charge. 4 in series is 88.8V Nominal and 100.8V at full charge. The maximum normal voltage with 24 LiFePO4 cells would be 87.6V. Would 4 of the Lipos in series be too much?. Also I would like to bulk charge with my TC charger which has max Voltage of 87.6V. As you can tell I am rather new to battery tech and do appreciate your input. pahealey wrote: I have been looking into Lipo option suggested by Jordan. 6S lipo cells are 22.2V or 25.2V at full charge. 3 in series gives 66.6V nominal voltage or 75.6V at full charge. 4 in series is 88.8V Nominal and 100.8V at full charge. The maximum normal voltage with 24 LiFePO4 cells would be 87.6V. Would 4 of the Lipos in series be too much?. Also I would like to bulk charge with my TC charger which has max Voltage of 87.6V. As you can tell I am rather new to battery tech and do appreciate your input. You wont be able to use your charger unless you can dial the voltage down. Most of the bulk chargers (no balance ports) you can adjust the output of the charger. What i plan to do is get 3 power supplies and series them to get my output of 75v nominal. If you are planning to go with lipo you will need a balance charger (RC). These can be pricey. Also you need to work out the amps you are pulling to match the C rate of the batteries. If talking lipo's go with 1/4 of the stated C rate stated. Would getting rego be a problem with Lipo cells ? Also the thought of individually balance charging 9 or 12 or 15 cells every 2-3 weeks sounds onerous. However, your option is far and away the cheapest way to get a 36 or 48 or 60ah pack into the bike. I hope those Hobbyking cells stay on sale while I ponder. pahealey wrote: Would getting rego be a problem with Lipo cells ? Also the thought of individually balance charging 9 or 12 or 15 cells every 2-3 weeks sounds onerous. However, your option is far and away the cheapest way to get a 36 or 48 or 60ah pack into the bike. I hope those Hobbyking cells stay on sale while I ponder. I have decided to go with Nissan leaf modules with Graeme at Suzi auto. I have ordered 10 modules and should be able to charge these with my TC charger. Due to the delay til these come, probably 2-3 months, I have also ordered 3 12Ah lipos from hobby king to get the bike going. After factoring in the cost of chargers for the lipos as well as the hassle they were less attractive. I will use the 3 lipos for a battery pack for my e-bike after getting the nissan modules. Still have to figure out the wiring though.